When you whip up a delicious, frozen margarita in your party machine at home, the last step is probably to add a lime. Not only does this iconic Parrothead fruit add an eye-catching color to your cocktail, but it injects a little more of that lime flavor that makes your margarita really pop. However, reaching for a lime every time you blend a perfect margarita in your frozen concoction maker can get boring. Try switching it up and using one of these other enticing fruit garnishes to complement your drink and help you relax in style. If you make a basic margarita, there are only a few ingredients: Lime juice, tequila, ice, triple sec, sugar and orange juice. While the traditional lime wedge goes well with its juice, why not try to accent the orange juice instead? Use a chunk of orange peel as a garnish for your next margarita. All you need to do is peel an orange, then, on a cutting board, carefully cut the peel into a fun shape. Try a star or heart for a festive, simple shape. Or try to make a palm tree if you're feeling ambitious. Just make a slit in the bottom of the orange peel to slide it onto the side of the glass. Use strawberries in the margarita and as garnishes. What goes better with lime juice than strawberries? Instead of matching the flavor of your margarita, complement it with fresh strawberries. Cut thin slices of strawberries and place them directly on the top of your frozen margarita. In addition to regular lime margaritas, strawberries are a great garnish for a number of other tropical margarita flavors such as peach or mango. Try them all! 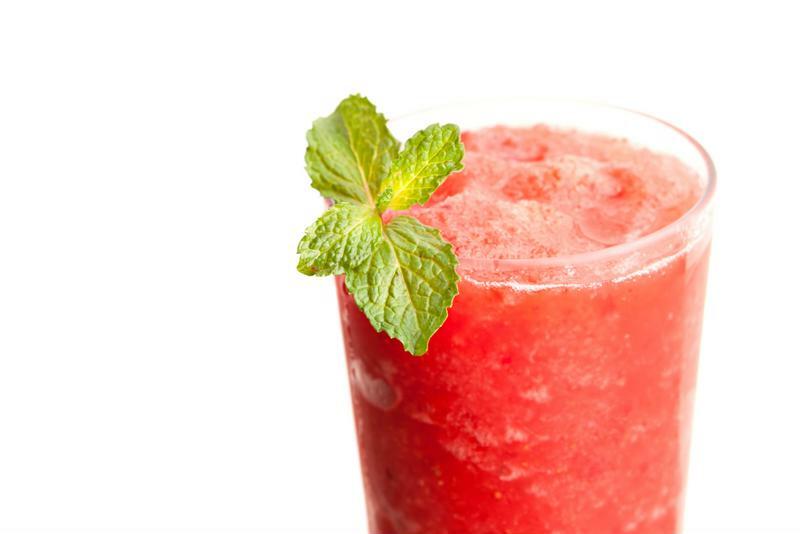 For the summer, use chunks of seedless watermelon to garnish your frozen cocktail. Not only does the pink color look great with the green drink, but the porous fruit is bound to absorb some of the cocktail, making for tasty snacks at the end of the drink. What's more tropical than pineapple? Slice small wedges of pineapple to sit on the side of your margarita glass. Like with the strawberry slice, pineapple goes particularly well with different flavors of margarita. If you do opt for using pineapple slices as garnishes, consider cutting a bunch at one time and freezing some for later. That way, you can simply grab a wedge or two from the freezer rather than cut new slices for each drink. 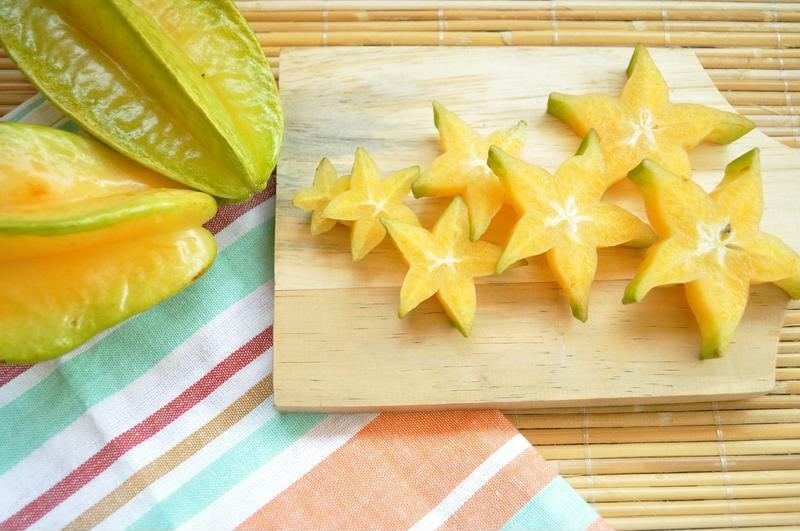 Impress your friends with starfruit garnishes. Go truly exotic with these visually pleasing fruits. They're sweet and available at many grocery stores. Just cut a thin slice of this fruit and you'll have a beautiful star garnish. Forget the maraschino cherries you have at the bar and use fresh cherries. Add a few to the actual drink in your frozen concoction maker's blender jar before you make the drink and garnish with pitted cherries afterward. You'll end up with a sweet, tart cocktail that you'll thoroughly enjoy.